Last August, Franklin Crawford explained the who, what, where, when, and why of this project in his blog about life in Ithaca. Here’s an excerpt. When Jeff “The Ampersand” Furman, chair of the board of Ben & Jerry’s, and Brad Edmondson teamed up to document the history behind the Vermont-born ice cream business, they’d been yacking about it for a dozen years. Furman was initially hesitant about a book. His coffee klatches with Edmondson were just a way to vent during his long, complicated struggle to save the company’s social mission. Furman just wanted to “talk about the story,” Edmondson says. Then Furman, the old hippie realist, with his graying beard and long silvery laurel wreath of hair, stepped back from his insider role and saw that the story had a message worth sharing. Maybe in a magazine article? Edmondson was firm: This was no one-off in a glossy. The Ben & Jerry’s story deserved full treatment in book form. It’s a business saga with a local angle. Furman lives in Ithaca and is as much a piece of the company – he wrote their first business plan – as the two chubby guys who got it going. Hence the nickname “Ampersand.” He also helped to save the company from losing its three-part mission after Unilever bought it. The tale reads like a gritty 1940s-style novel about how the little guys win without compromising their “souls.” Oh, but they almost do. There is high drama, tension, sadness, buffoonery, stupidity, cupidity, and heroism. Edmondson describes the little company-that-could as it grows, stumbles, and is almost devoured by Unilever, social mission and all. But led by Furman and an intrepid board, the B&J brand struggles with the world’s second-largest food conglomerate until they find ways to co-exist. While the struggles continue, the book has a reasonably happy ending and lots of lessons for other businesses. It was anything but easy to get the story, and the book’s casual style hides this. Ben Cohen and Jerry Greenfield declined to be interviewed, so Edmondson went into the hole like a rat terrier. “The deeper I dug, the more interesting it got,” he says. He interviewed about three dozen people and reviewed “several hundred pounds of internal documents,” he says, spending two years working full-time on the book. Since the early 1980s, Ben & Jerry’s has pursued its bottom line while advocating and applying its philosophy of “linked prosperity.” The idea is that everyone, including the cows, should benefit from their product. So the company’s employees earn good wages, farmers are well paid, the product is packaged in biodegradable paper, and the company makes a strong commitment to the community. That commitment includes programs that teach kids how to become business people, such as the Ithaca Scoop Shop that was owned by The Learning Web, a local not-for-profit (it closed about a decade ago). Profits were fine, but ideals came first. This vision survived, barely, during the long and complicated negotiation that lead to the company’s sale. Under the sales agreement, Unilever is the sole shareholder of Ben & Jerry’s, and it controls the company’s economic and operational decisions. But Ben & Jerry’s also has a separate Board of Directors that is not controlled by Unilever, and Jeff is its chair. This board elects its own members, and exists in perpetuity. It acts as a watchdog and has the legal authority to block proposals that lessen product quality or impede the social mission. As sales increase, investment in the social mission must also increase. Today Ben & Jerry’s operates stores in 35 countries and annual sales are about $500 million, up from about $200 million when the company was sold. You can find Ben & Jerry’s in Belfast, Istanbul, and Mexico City, and the company is planning for the day when more of its ice cream will be sold in other countries than in America. The social mission is thriving, too. By the end of 2013, all of the ingredients used in Ben & Jerry’s will be fairly traded and free of GMOs. With Furman at the helm, the board is ensuring that the company’s ingredients come from sustainable agriculture, that a transparent social audit is published every year, and that “linked prosperity” isn’t a household name for a failed social compact. 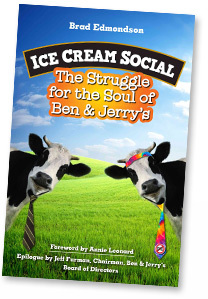 “I have spent half my life connected to Ben & Jerry’s,” writes Furman in the book’s epilogue. “The talks I had with Brad were not easy for me. They brought back a lot of the old, hard emotions of the personal collective loss and failure we all went through as we lost control of the company and struggled for years afterward.” Yet in the end, Jeff “The Ampersand” Furman sang. The result is an intelligent read that also will touch the hearts of anyone who ever fell in love with Ben & Jerry’s ice cream, and what they stand for. – Photo and story by Franklin Crawford, tinytowntimes.com.